Astha Ummat, of the School of International and Public Affairs at Columbia University, won the 2017 Business Case Award for her work at Centerbridge Partners and Great Wolf Resorts Inc. - the largest owner and operator of family oriented waterpark resorts in North America. Astha was brought on board to identify opportunities for improving energy efficiency and installing renewable energy systems. After analyzing energy consumption across the Great Wolf Resorts portfolio, Astha researched and proposed energy efficiency projects that would provide an average payback period of 2.6-4.1 years. She ranked the recommended opportunities based on financial returns, focusing on leveraging federal and state utility rebates, created an implementation plan for the interventions and developed a scale-up/replication plan for the rest of the lodge locations. Astha’s work could save up to $1.5M in energy costs, offset 12.7 million kWh of electricity and save approximately 9,000 metric tons of carbon dioxide emissions. Yiping Shao, of Shanghai Jiao Tong University, won the 2017 Innovation Award for his work at Shanghai Shen-Mei Beverage & Food., Ltd, one Coca-Cola’s largest bottling facilities based in China. Yiping developed an electricity usage prediction model that can predict the daily total electricity consumption of the entire plant for a one-month period with the margin of error less than 2%. As part of China’s current electricity pricing reform, the model enables Coca-Cola to provide utility companies, looking to better plan and balance demand and supply, with an estimate of their predicted electricity use prior to each purchase cycle, therefore avoiding electricity waste and increasing reliability. Yiping also recommended a suite of energy efficiency upgrades, which, together with the model, have the potential to save Coca-Cola roughly 450,000 kWh of annual electricity savings and 130 metric tons of CO2 emissions reductions. 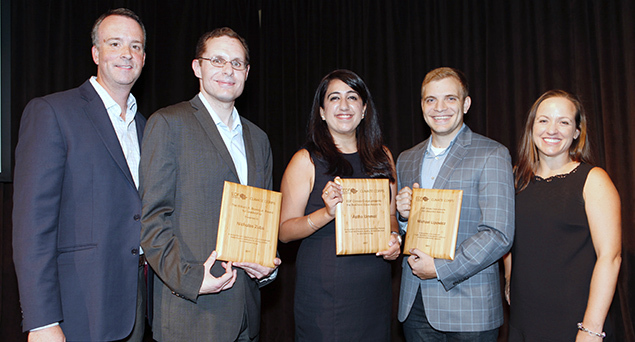 Michael Lipowicz, of the Rackham School of Graduate Studies at the University of Michigan, won the 2017 Collaboration Award for facilitating collaboration to advance Amgen’s corporate sustainability solutions and strategies. Amgen, a global biopharmaceutical company, has already made progress on GHG emission reductions across buildings and vehicles, but wanted to evaluate its Scope 3 greenhouse gas emissions as well as create and implement a feasible carbon emissions calculation strategy. Michael sparked collaboration across departments at Amgen, conducted life cycle assessment research and outlined strategic planning for the collection of comprehensive data to then evaluate the company’s Scope 3 emissions. By engaging myriad departments, consultants and existing resources and databases, Michael linked the sustainability team to other facets of the company and ensured increased transparency and the creation of new environmental improvement projects across Amgen’s operations. Business Case - Lillian Mirviss, Gap, Inc.
Lillian Mirviss, of the Bren School at UC Santa Barbara, won the Business Case Award for her work at Gap, Inc., where she built the business case for renewable energy. To help Gap achieve their ambitious goal of reducing global GHG emissions 50% by 2020, from a 2015 baseline, in owned and operated facilities, Lillian explored opportunities for renewable energy at its North American distribution centers. She identified three potential locations for solar photovoltaic projects – New York, Ohio and California. Over the course of the 20-year contracts, Lillian’s recommended projects in NY and CA could save up to $5.4 million total in net operational costs, offset 9.6 million kilowatt hours of fossil fuel electricity and save 2,400 metric tons of carbon dioxide emissions. Reagan Richmond, of the Bard Graduate Program in Sustainability, won the Innovation Award for her work with Connecticut Green Bank on developing creative solutions to energy challenges. The Connecticut Green Bank has been on the leading edge of innovative clean energy finance through its Commercial Property Assessed Clean Energy (C-PACE) program, but recognized an opportunity for growth with the commercial real estate industry. Reagan completed a landscape analysis of Connecticut Green Bank’s current partners, developed a roadmap for future potential partnerships and created a tool for their ongoing evaluation. She also identified several new avenues for value-adding partnerships, which serve as both leads for Connecticut Green Bank, as well as opportunities for learning about, and collaborating on, resources with CRE groups. Katherine Altobello-Czescik, of Columbia University, won the Collaboration Award for her work with the City of Fresno, where she catalyzed community engagement for advanced energy management. The City of Fresno is embarking on a unique, community-scale energy project called “Power the Tower”, aimed at helping local businesses and creating a net zero neighborhood. Working on the development phase, Katie researched what other cities are doing in terms of energy efficiency, renewable generation and electric infrastructure, developed a Technical Advisory Committee and a community roundtable to understand energy needs as well as receive feedback about the project’s design and scope, and helped set up funding. Her plan for implementing energy efficiency projects, demand response and solar power will bring the City closer to achieving its goal of transforming Fresno’s Tower District into a clean energy hub, helping local businesses with operating costs and reducing its carbon footprint. Shaun Takao of Yale University won the Best Business Case Award, for his work at adidas Group with supervisor and EDF Climate Corps alumna, Elizabeth Turnbull Henry. Takao identified economically-justified, next-generation LED lighting and control systems for two distribution centers and identified retail stores where implementing energy management systems (EMS) would make the best business case. The recommended lighting and EMS upgrades could save the adidas Group $1.4 million annually by reducing energy consumption by nearly 12.4 million kilowatt hours each year, equivalent to greenhouse gas reductions of more than 8,500 metric tons annually. Dennis Bartlett of Duke University won the Innovation Award for his creative approach to building the business case for investing in distributed generation at US Army Fort Bragg. Fort Bragg pays some of the lowest electric rates in the state, creating a substantial hurdle for energy efficiency of conservation measures. By identifying many “hidden” costs to electricity, Bartlett determined that Fort Bragg has enormous potential to benefit from combined cooling heat and power (CCHP). A 5 megawatt system could offset over 15,000 metric tons of carbon dioxide emissions each year and save over $9 million dollars in present value, as well as provide increased energy security and resiliency. Maxwell Sykes of Si¬mon Fraser Uni¬ver¬sity won the Collaboration Award for his work building the in-house capabilities needed to manage a long-term energy management program at the Austin Independent School District (AISD). Through interviews with staff from school districts across the United States and the AISD team, Sykes recommended an energy management program that could help the district avoid $1.7 million to $5.2 million in energy costs every year. Sykes’ fellowship culminated with a presentation to potential internal Austin ISD champions, including the Board President, CFO, Executive Director of Facilities, Executive Director of Construction Management, Director of Maintenance, and Sustainability Coordinator, in addition to local energy efficiency and environmental advocates. Nicholas Zuba recommended an entire portfolio of projects that his host company, CA Technologies, could implement in their +700,000 square-foot facility, including: installation of a “chiller variable frequency drive”, installation and integrating building controls, lighting upgrades, and changes to fan schedules and parking rules. Zuba also found that, by using an energy dashboard to transmit real time data (showing electric and natural gas usage, for example), energy consumption could be reduced by counteracting anomalies and altering employee behavior. Zuba’s recommendations could save CA Technologies 3.7 million kilowatt hours of electricity, nearly 6,100 therms of natural gas and almost 2,500 metric tons of carbon emissions annually, equivalent to nearly $440,000 in annual savings. Rob Youngs recommended a series of initiatives building upon the recent effort to benchmark and disclose energy use in city buildings throughout Los Angeles, including: “bottom-up” energy savings through employee engagement and energy competitions, increasing the use of building HVAC automation software to increase occupant comfort and save energy in LA’s largest buildings, and streamlining a HVAC retro commissioning program. Youngs then developed a roadmap to deliver 14 percent energy savings across more than 500 buildings. These projects could save the City of Los Angeles over $2 million in net operating costs in the first year, as well as 17 million kWh and over 7,000 metric tons of carbon emissions. Fatou Jabbie conducted an energy efficiency assessment of one of Northrop Grumman’s data centers and identified six, top-level recommendations, including: improvements to lighting and set-point temperature adjustments, data center operational systems including rack and POD configurations, optimized energy use for airflow management, on-site energy security and power generation, and evaluation of an on-site combined power, cooling and heating generation system. Jabbie was one of the most frequent posters on the EDF Climate Corps LinkedIn group, sharing resources and organizing opportunities for others to share. She even convened weekly conference calls for all of the fellows involved in finding efficiencies in data centers.